Yesterday's weigh-in shows another 1.6 pounds down - hooray! In addition, I walked 77000 the past week, so I'm catching up on the 10,000 steps a day pace. If the rain will go away, I hope to be totally caught up this coming week. My eating the past two days hasn't been great - actually eating less than I should, and what I have eaten hasn't been the greatest. Hope to get that back into place tomorrow. I am so over this cold and rainy weather! I really like walking, but the weather lately has been ridiculous. I did make it out for a walk yesterday, and found that my shoes and the bottom of my jeans were all nice and muddy. Ah well. ;) If this weather would warm up and dry out a bit, I would be able to move more - and hopefully help the scale move in the right direction. Everyone needs to work on getting enough fiber in their diet. I'm aiming for 35 grams of fiber a day, which is definitely a challenge. 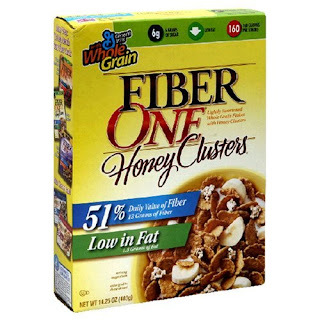 I bought two varieties of Fiber One - the original pellet-y variety and the Honey Clusters. Oooh, I like the honey clusters. Little clusters of oat-y type things and big sweet flakes of bran, I assume. Tasty stuff. A bit higher in calories than I usually go, so I've been having a half-cup of this along with something else. Tonight I had the half-cup with a container of light yogurt and a diced pear. Good stuff. Sauteed half a package of sliced mushrooms (I think the package is 1/2 pound? - about a cup) in a small non-stick skillet until all the moisture was gone, and put aside in a small bowl. I minced these up later. Sauteed a minced small yellow onion in the same skillet (after wiping it clean) until the onion was cooked. I put this aside in another small bowl. Sliced up eight slices of light salami ("Gallo Light Italian Dry Salame is made with turkey and pork and has 60% less fat and 40% fewer calories than regular dry salami") into teeny tiny pieces and then sauteed them to cook out some of the moisture. Added a chunk of tomato paste (sadly way too much, I think about 1/2 of the can) to the skillet, then added two garlic cloves, minced. Added back in the mushrooms and about half of the onion. Heated this through, and then added 1/2 cup of light mozzarella, finely shredded. Bad idea - I should NOT have put this in with the hot items, it was a horrible idea and made making the wontons very much a pain. On each of the wonton wrappers (I used the round variety, 30 total), I put a small scoop of the mixture, wrestling with the melty cheese. Sealed 'em up and finished them all. I put them on a foil-lined cookie sheet, after spraying first with non-stick spray. I also did another light coat of spray on the wontons after I put them on the sheet. Into a 450 degree pre-heated oven. Seven minutes was one minute too long. Good stuff! Sauteeing everything ahead of time took some effort, but the wontons weren't soggy at all. I didn't taste much of the salami, and the cheese flavor was overwhelmed - too much tomato paste for sure. I've been in a wonton phase lately - we made oodles of wontons at a friend's house last weekend: chicken, pork, and TVP (a vegetarian protein), and ate them in homemade chicken and vegetable stocks as appropriate. So very tasty. Wonton Pizza Bites? I haven't tried these yet, but Roni made them & they look fantastic. Check out Green Lite Bites for the recipe and instructional video. I really want to make some crab rangoon this weekend - also baked, of course, but with tasty crab and cream cheese melty love inside. I'm a total numbers geek (though I hated statistics class in college). When I heard about physicsdiet.com I was intrigued. You enter in your weight, calories consumed and calories burned each day, and then it gets with the geeky - calculating all kinds of averages and rolling figures and such. It really helps to show you the trends - and to show you to not jump off a ledge if your scale shows a 2 pound gain overnight. I know there's a lot of discussion about how often one should jump on a scale. I do it every single day, in the morning before I shower, before I eat or drink anything. For me, I need that daily feedback - and physicsdiet.com really helps to show me the trends and to not obsess about one day's numbers. It's free - check it out! Geek that I am, I see that I am short 12600 steps of where I should be - too many work days with less than 5000 steps really hurts that total. TiVo'd an episode of E's "THS Investigates" a week or two ago - this episode was all about fad diets. Pretty interesting stuff - at the end, there was a few minutes about my site of choice, Sparkpeople.com (and yes, it's a very sane site and one that they said was helpful). More interesting than the things that worked were the crazy diets that people used that didn't work, including people back in the late 1800's who basically drank liquid dynamite! Shockingly, many died because their bodies overheated. Doh. Crazy to think that our society's obsession with weight started all that time ago. Scariest diet they showed: a tapeworm diet! AIE. Now, I'd love to lose ten pounds without dieting, but sheesh, I'm not going to eat a tapeworm! Ew. Ew!! More on that fabulous diet over at Big Fat Deal. Argh, this plateau just won't quit. So I've bought yet more 'healthy' food - more reviews coming, for sure! It's so flippin' cold outside that getting some walks in is difficult, especially with it still getting dark early. I hate plateaus. I really do. I've been bouncing around the same five pounds for the past two months and it's driving me batty. The holidays are over so there are no more excuses, right? Here's to more salads, more walking, and less weight. 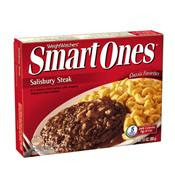 Another Smart Ones entree, this one is great! 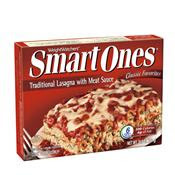 It's a "traditional" lasagna with meat sauce and is really tasty. It's three layers with ricotta and seasonings between each, and tomato sauce with tiny meatballs on top. It's a good sized portion and a great solution to that pasta craving I get every now and then. Mmmm, popcorn. I love popcorn, and the Smart Pop line from Orville Redenbacher's is pretty darned tasty. A good amount of salt and a light butter flavor is great. I buy this by the case from Costco and we usually share a bag at least once a week. Good stuff! 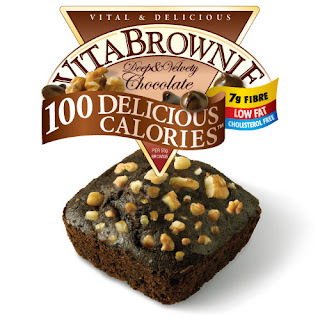 These VitaMuffin products are really pricey, but they're 100 calories for chocolatey goodness - had to try them. Stored in the freezer, you microwave them when you're ready to eat. I really, really want to like these but they're just okay. I don't care for the walnuts on top, but I do love a warm chocolate treat. I like to top one with a dollop of whipped topping or Marshmallow Fluff (surprisingly low in calories!). I like other VitaMuffin products better than this one. 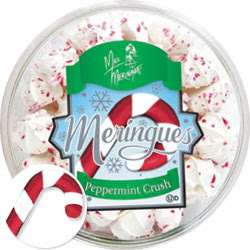 I'm a fan of the Miss Meringue products, and I love candy canes, so why not? Well, they're not very good. They're the mini vanilla meringues with some crushed stale candy canes sprinkled on the top. 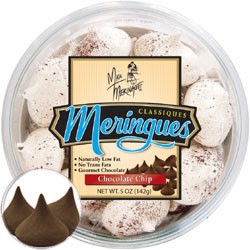 No mint flavor in the meringues. The candy cane bits tasted really stale and not all that good overall. Meh. Anywho, they satisfy my sweet tooth nicely. I nibble on them, and let the meringue melt on my tongue. So tasty. 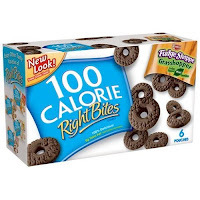 These come 13 tiny cookies to a pack - they look like chocolate covered Froot Loops (they're tiny, I tell you, and there's a hole in the middle). Actually, they're only coated in chocolate on the bottom, but the tiny cookie itself is dark brown and has little ridges on it. This is crying out for a cup of milk on the side. Oh. My. Gosh. They're fantastic. The smell is right. The flavor is right. The chocolate is good. The mint is good. They're ALL GOOD, people! I will so be buying more of these. Awesome. Go Keebler! This is one of my favorite Smart Ones so far. It's not the biggest portion of either food - but it's also only 260 calories. The mac & cheese is tasty. The salisbury steak is your typical ground beef patty thing, but the onion gravy works well with it. Two thumbs up here!